The story of a young woman whose diabolical smarts are her ticket into a charmed life. But how many times can someone reinvent themselves? You be the judge. Imogen is a runaway heiress, an orphan, a cook, and a cheat. Jule is a fighter, a social chameleon, and an athlete. An intense friendship. A disappearance. A murder, or maybe two. A bad romance, or maybe three. Blunt objects, disguises, blood, and chocolate. The American dream, superheroes, spies, and villains. A girl who refuses to give people what they want from her. A girl who refuses to be the person she once was. I was genuinely optimistic about reading this book despite not loving We Were Liars. I kinda have a love-hate relationship with the author’s writing style so I was determined to give this a try, and I can say that Genuine Fraud left me shookt. Shookt but not in a OMG-THIS-BOOK-IS-SO-GOOD way but more of a WTF-DID-I-JUST-READ way. Honestly, I will not attempt to explain to you the plot just read the synopsis and be content on the information there. I was almost 1/4 into the book but I still didn’t know what was going on, but it’s a psychological thriller so I just read on. It’s written in a reverse chronological order that will reveal the whys and hows of the story. It’s not a full on suspense or thriller story but it definitely has the vibes and will give you an unsettling feeling while reading. The story follows Jules West Williams, she’s not your typical heroine. I found myself rooting for her despite not liking her. Her character is ambitious, complex, and badass. How can you not root for a badass female lead right? So I just forgot about morals and enjoyed her story, it felt like watching a movie. I could clearly see this book as a movie, I think the suspense and mystery would translate better on-screen than on the pages. Like I said I won’t spill anything about the plot because it’s hard to do without giving away some spoilers but the overall “mystery” isn’t hard to guess. I mean, there isn’t a whole lot of mystery in the first place. You’ll eventually get the gist of what was happening and the ending would just confirm everything. I loved E.Lockhart’s writing style especially in this book, it didn’t have the pretentious and poetic writing in We Were Liars but it was crisp and punchy. You could definitely read this in one sitting because it’s short plus each chapter will leave you wanting to know more. 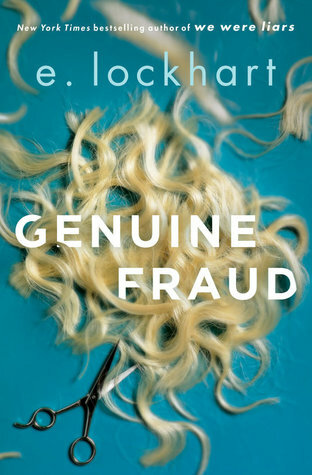 Overall, I enjoyed reading Genuine Fraud but I wish there was more to it. It had the potential to be a mind-blowing and heart-racing book, sadly it did not deliver. It’s still an intriguing read that’s worth your time so I definitely recommend this to everyone who wants to read a short and fast-paced suspense/thriller. A huge thank you to Penguin Random House International for sending me an ARC of this book. That’s all, thank you so much for reading. If you want to read more book reviews from this blog, just click here. And you could also find my reviews in Goodreads. My name is Louise and I am a teenage muggle girl. I love reading books (obviously). I’m sorry but I do not give 3 free wishes however, I do post book reviews and other book related stuff. Thank you for stopping by! All the Updates #4: What Happened + In Need of Book Recommendations!